We like traditions in our family. We have one for each and every holiday you can imagine as well as some holidays we made up that aren’t as well known. For Mother’s Day, our tradition has always been to let me sleep in until I am awakened with a scrumptious surprise breakfast. (Of course this means that I pretend to sleep while wishing for a cup of coffee and listening to the sweet whispers and giggles of two little girls intertwined with the slamming of cupboard doors and laughter of their daddy.) That didn’t happen this year. Instead I was awakened by Mimi gently shaking my shoulder and asking what time we were supposed to be there. I mumbled the answer and rolled back over. Mimi shook my shoulder again and said that I needed to get up because it was 6:30 and we were supposed to be there now. We both started out clean and blindingly white. (When the heck did my baby girl get to be taller than me?) Mimi took off running with one of her friends at the starting line, while I hung back and walked with the mom crowd. 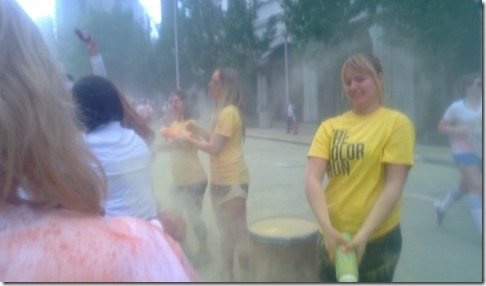 At each kilometer there were about a dozen volunteers waiting to bombard us with brightly colored corn starch. 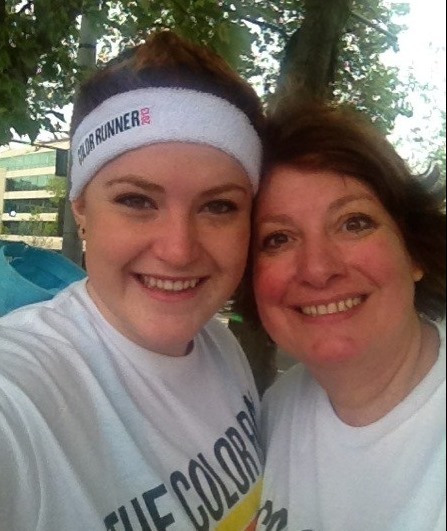 Of course, by the end of the run/walk we all looked like we had been attacked by a rainbow. Aren’t we bee-u-tee-full? This entry was posted in Coffee, It's all about me!, Mimi, Random stuff and tagged 5K, Breakfast in bed, Mother's Day, rainbow, The Color Run. Bookmark the permalink. 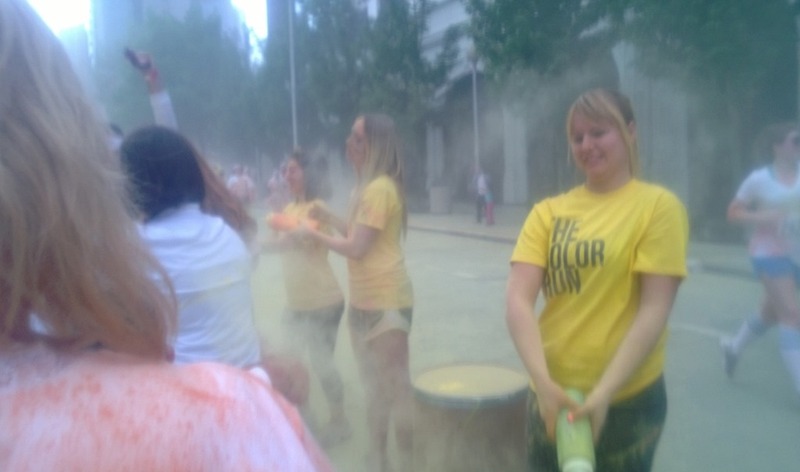 The colored cornstarch sounds like so much fun! In 2009, I celebrated Mother’s Day in Corpus Christi, TX with my youngest daughter by running in a 5K with her. It was a memory I will always cherish! Afterwards, she treated me to a “spa day” with all the pampering a girl could want! We also had an awesome seafood fine dining experience that evening. Thanks for sharing your Mother’s Day with us. Spa Day? Oh my…I need to have a chat with my girl, that sounds wonderful! It was awesome! We had massages, facials, manicures, pedicures – the whole enchilada! She’s my baby and she claims I spoiled her growing up and so now it’s her turn to spoil me! I’m blessed, in deed! Haven’t done a mud run, but have heard they are definately a full workout! I think I’ll pass too! Coffee or no coffee, I’ve come to accept that the washer and dryer take turns consuming one sock out of every pair. Therefore, I have declared it permanently cool to wear mismatched socks. Looks like fun! Glad you had such a beautiful, colorful day. What a wonderful way to spend your day! Well you are both brave AND beautiful! I’m way too self-indulgent to get up on Mother’s Day at 6:30AM and run. Or walk for that matter. Cuuute pictures though! Doing a 5K had been on my List for a really long time. When this one came up last year, we just jumped on it. I don’t think they are going to switch the day around just for us moms though!